And guess what? I just got the Crabtree & Evelyn latest edition, Somerset Meadow on my hands. Let me begin with a short introduction about Crabtree & Evelyn before i take you away to Somerset Meadow. Crabtree & Evelyn blends the very best of nature and science, tradition and innovation, and luxury and comfort to create benefit-rich bath, body, and home care. This heritage is reflected in its name: Crabtree, from the crabapple tree, the original species from which all cultivated apple trees have derived, and Evelyn, from John Evelyn, the 17 wrote one of the first important works on conservation and whose motto, ‘explore everything, keep the best’, inspires the brand to this day. Crabtree & Evelyn is available online and in more than 40 countries, with over 6,000 locations and 500 concept stores worldwide. Crabtree & Evelyn has recently launch a new range Somerset Meadow. The idea of the whole range of Somerset Meadow comes England’s natural beauties, the meadows and rich grasslands of Somerset, sanctuaries of wild loveliness, have long been revered. 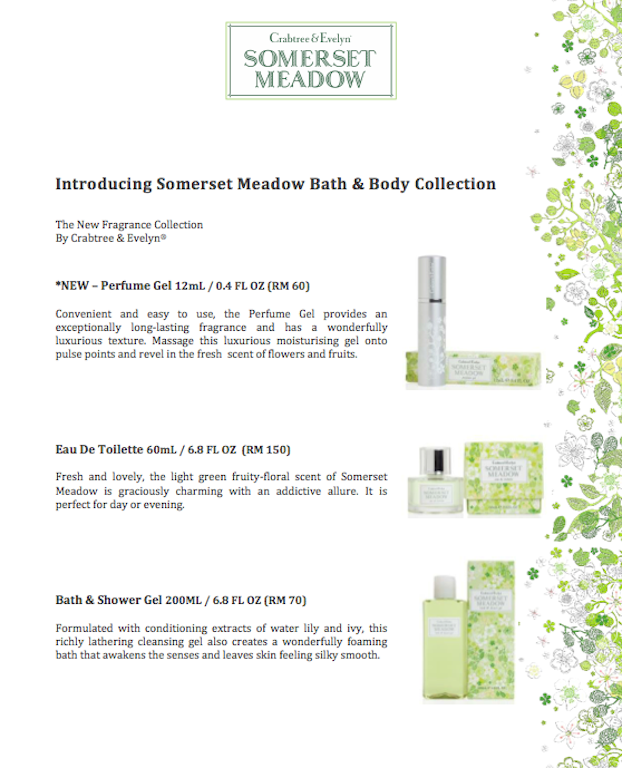 Not forgetting, Somerset Meadow Perfume Gel is now a new introduction from Crabtree & Evelyn. For the first time, Perfume Gel is being launched as part of the collection. So are you ready for me to take away with Somerset Meadow?! My green meadow Crabtree & Evelyn Somerset Meadow Collection, and guess what's inside? 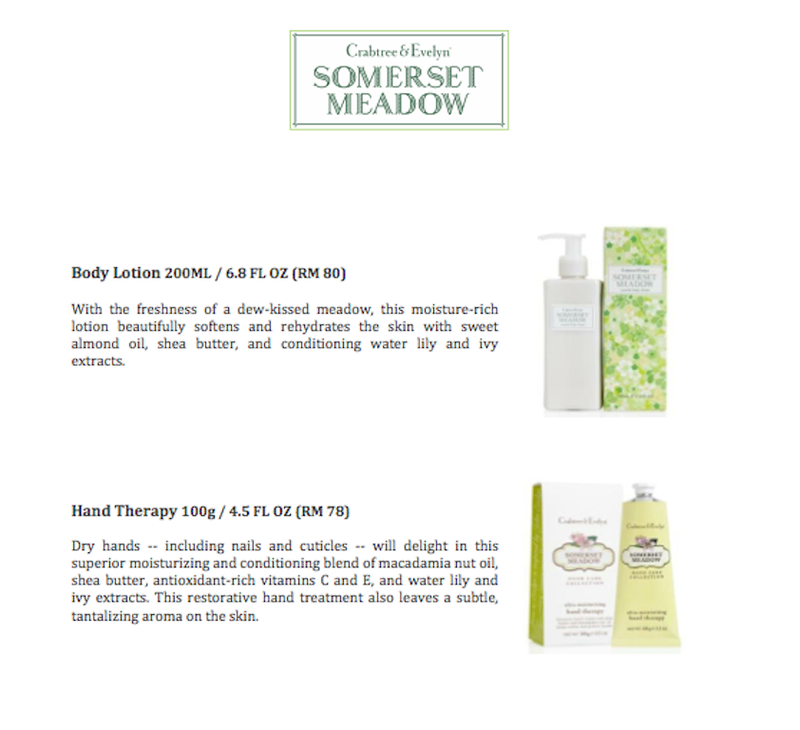 The Somerset Meadow Collection features a Perfume Gel, Eau De Toilette, Bath & Shower Gel, Body Lotion and Hand Therapy. All are packed within beautiful packaging, illustrated with the pretty fruits and flowers of the meadow. It is also comes in gift sets to delight and surprise its recipients. Somerset Meadow with a heart of white blossoms, water lily and earthy geranium flourishes as if warmed by the morning sun. The scent of leaf, grass and fragrant petals are suffused by creamy clouds of musk, whilst willow and moss tether all the casually floating notes close to the skin and bring a soft, sensuous touch. Somerset Meadow brings a fruity floral fragrance smell with a little fresh, bright and joyful. Such a casual chic with modern elegance, not too strong, my liking! It is formulated without parabens, phthalates, mineral oil, or propylene glycol. And here's my basket of the Somerset Meadow collection. Of all the products, My favorite one will definitely goes to the Eau de Toilette! Such a refreshing sense. It even last longer than i thought it could. Now i found a new love for my daily working routine. 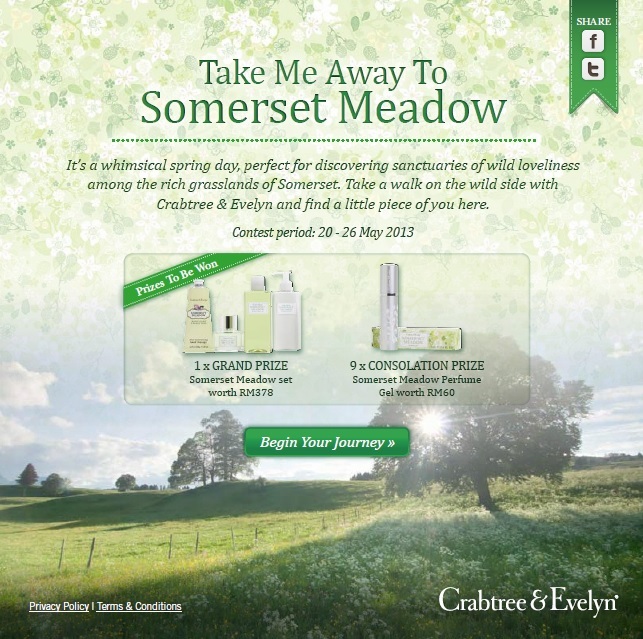 Crabtree & Evelyn is also now taking users on a little adventure to the Somerset Meadow. There will be a Facebook game coming up along the way, asking to answer simple questions that serve as something like a personality quiz. Their selection of choices will determine what part of the meadow they end up in and how it suits their personality. The experience will be lightly animated and at the end, they'll be asked to 'invite' friends to the meadow (to experience it with them). Finally, they'll be prompted to view the collection and to submit a slogan on Somerset Meadow. Best slogan will be rewarded. Sounds easy right? Contest period starts from 20-26 May, 7 days available only! Prizes that worth RM378 with just some simple questions, why not? 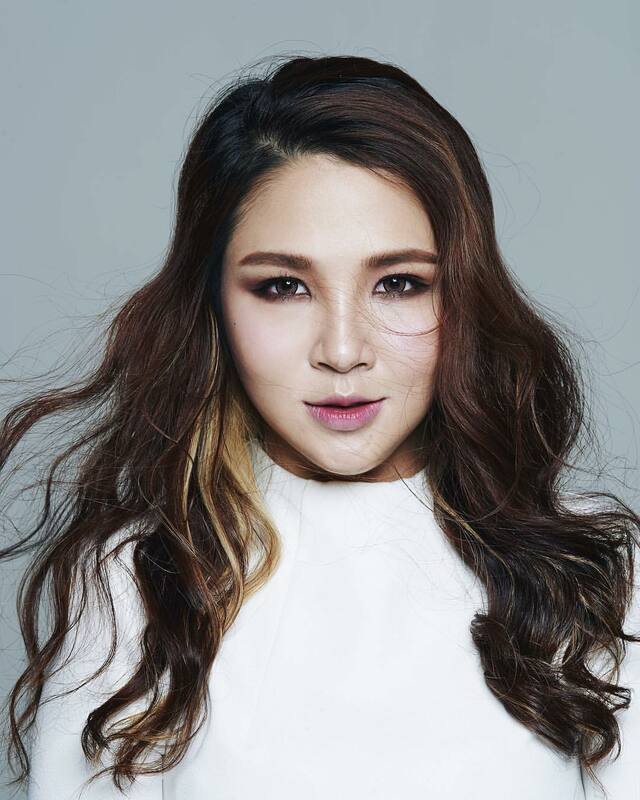 For more information about the game, kindly visit Facebook Game App – Crabtree and Evelyn Malaysia. As for purchasing Crabtree & Evelyn products, please visit www.crabtree-evelyn.com.my. Till then, faster get yourself a set of Somerset Meadow to experience the green grasslands ambience. Fresh and green products.. Love it.